During times of profound social change, people’s psychological well-being is related to their assessment of their path from the past to the future [temporal relative deprivation (RD)]. A first survey conducted in Mongolia (n = 480) and data from a representative population survey conducted in South Africa (n = 2,711) are used to explore whether the status of one’s group during a time of dramatic social change moderates the relationship between temporal RD and well-being. Black South Africans and Mongolians (low-status group members) reported the highest well-being if they reported RD levels would decrease over time (even higher than group members who reported low but steady levels of RD). However, White South Africans (high-status group members) reported the lowest levels of well-being if they reported high and steady levels of RD (even in comparison with group members who reported that RD levels would increase over time). The implications of these different patterns and directions for future research are proposed. We are grateful to our participants who took the time to fill out our surveys. We also want to thank Vincent Williams, Fabrice Pinard Saint-Pierre, Thomas Marsh, Diana Cárdenas, and Sarah Gaham for their comments at various stage of this paper. Funding for Study 1 was provided by the Civic Education Project and FQRSC and for Study 2 by the SSHRC and CIDA. Lehohla, P. (2009). South African statistics 2009. Pretoria: Statistics South Africa. Retrieved from http://www.statssa.gov.za/publications/SAStatistics/SAStatistics2009.pdf. Mummendey, A., Kessler, T., Klink, A., & Mielke, R. (1999). Strategies to cope with negative social identity: Predictions by social identity theory and relative deprivation theory. Journal of Personality and Social Psychology, 76(2), 229–245. doi: 10.1037/0022-3514.76.2.229. Scheepers, D. (2009). Turning social identity threat into challenge: Status stability and cardiovascular reactivity during inter-group competition. Journal of Experimental Social Psychology, 45(1), 228–233. doi: 10.1016/j.jesp.2008.09.011. Tougas, F., & Beaton, A. (1993). Affirmative action in the work place: For better or for worse. Applied Psychology, 42(3), 253–264. doi: 10.1111/j.1464-0597.1993.tb00741.x. Tougas, F., de la Sablonnière, R., Lagace, M., & Kocum, L. (2003). Intrusiveness of minorities: Growing pains for the majority group? Journal of Applied Social Psychology, 33(2), 283–298. doi: 10.1111/j.1559-1816.2003.tb01897.x. Tougas, F., & Veilleux, F. (1988). 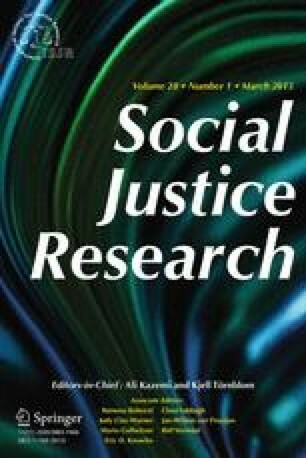 The influence of identification, collective relative deprivation, and procedure of implementation on women’s response to affirmative action: A causal modeling approach. Canadian Journal of Behavioural Science, 20(1), 15–28. doi: 10.1037/h0079920. Zagefka, H., & Brown, R. (2005). Comparisons and perceived deprivation in ethnic minority settings. Personality and Social Psychology Bulletin, 31(4), 467–482. doi: 10.1177/0146167204271711.